upholstered chair - my first one! It was so weird writing that title just now. I'm not sure if there will be any more in my future, but I can't believe I actually conquered the intimidation factor, and did it. There was lots of procrastinating along the way. But it's done! This went from a $15 thrift shop find, to a shabby chic beauty. The construction and upholstery were in great shape, it was just a little old smelling, dirty, and outdated. One point of inspiration for this chair was Amy's version- you can see by clicking here. I also pinned it to my DIY board on Pinterest. I loved the deconstructed look of it. The legs of the chair were painted in Annie Sloan's Pure White and distressed. I used both clear and dark wax on the legs to bring out the detail. 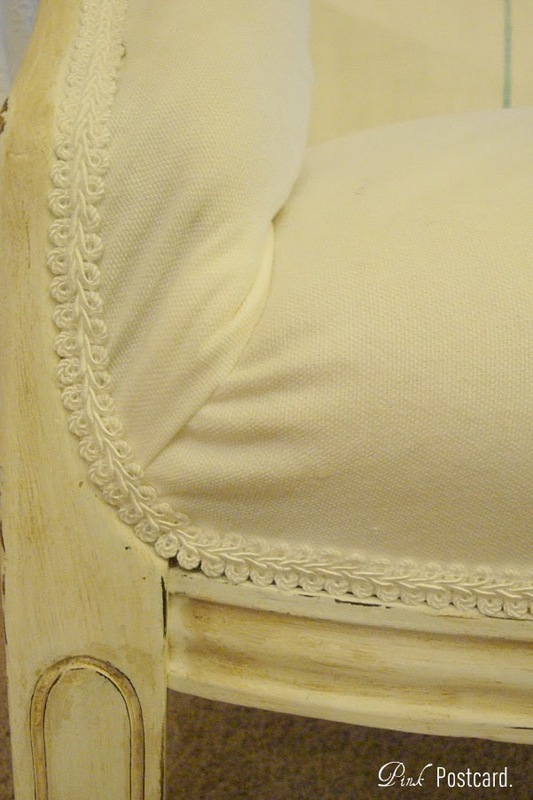 The original fabric was a heavy textured damask in olive and gold. 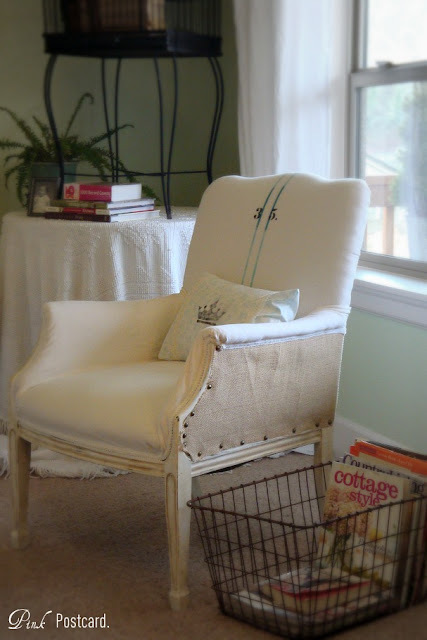 I used a white cotton duck (burlap on the sides). 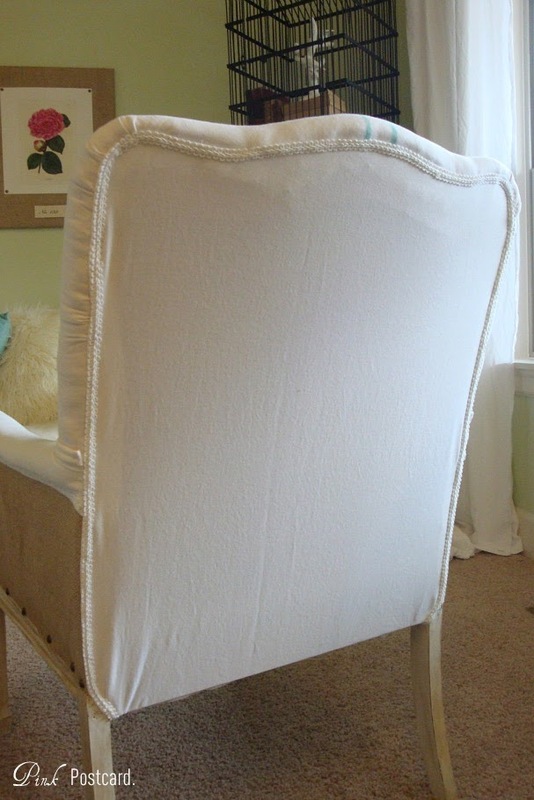 I've long admired Miss Mustard Seed's method of using white trim on her furniture. I gave it a shot, and was really happy with the results. 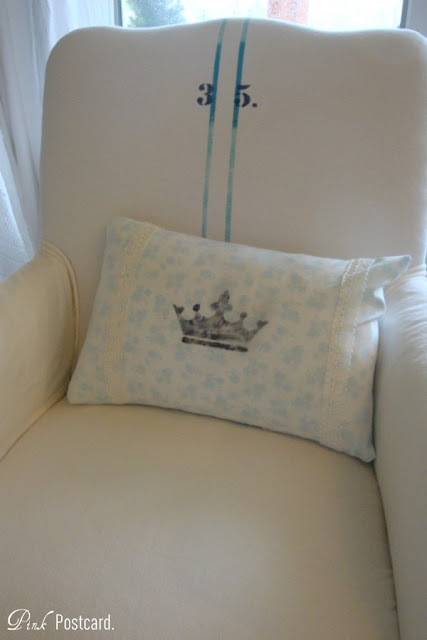 A little lumbar pillow to accent the chair. 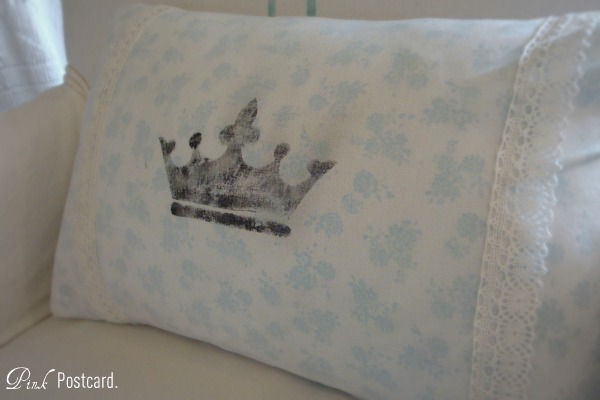 I used the inside of the fabric to soften the aqua print and then stenciled a crown onto the fabric. When the paint was half dry, I tossed the fabric into the wash to lighten the tone. Then, I embellished it with some vintage lace I had in my stash. I am so happy I tried my hand at this! It wasn't nearly as scary as I thought it might be. Tomorrow I'll be offering my insights on how I did this project from start to finish. You might even call it a tutorial. The living room is finally starting to become a pretty space! Wow you did a great job! Looks professional to me! Love the trim. I hope you are doing well! Much better. Love the softer look. wow you little smartie pants! Good for you! I love that chair! and now it is distinctively yours! Absolutely beautiful job, Denise! Wow! You rocked this chair as a first-timer! It looks extremely professional, girlie! How did you attach the trim? It really adds alot of class to the chair! Oh Denise I'm swooning, that is fabulous. Love your chair! The trim is the icing on the cake! I wish I could that! OMGoodness! Your chair turned out absolutely amazing! It is just gorgeous. I love it! Nice work, Denise! I am impressed! 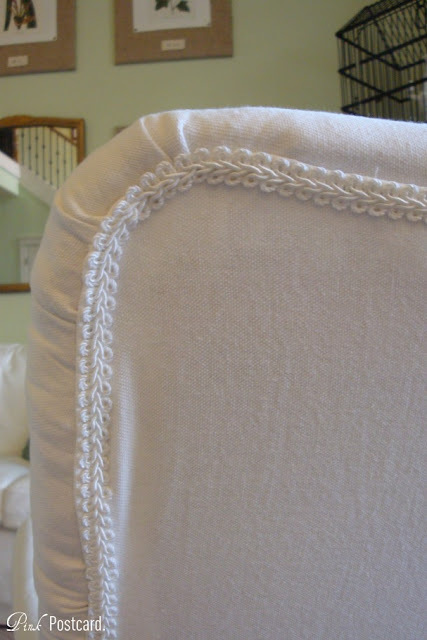 Upholstering has always intimidated me, but I would love to learn how! That chair is so sweet and so you! I am really looking forward to the how-to post! You should be very proud...she looks stunning...love that white trim too! Wow what a change you did a wonderful job I have one if you would like to practice and say it is your second!!! Are you sure this is your first?! I can't get over the fear to try one. I have enough trouble actually completing projects I know how to do! Looks terrific. Enjoy. For your first you did a great job. I love it. Denise it turned out beautiful!!! Good for you, you did an amazing job. I love the burlap on the sides and personal touches always make it that more special. Beautiful job Denise! Upholstery intimidates me a bit, but you have inspired me to give it a try. I have a chair waiting in my garage. I need to stop procrastinating! Thanks so much for sharing! This is just so lovely! I can't believe this is your first upholstery project, it looks perfect. Visiting from French Country Cottage. PS I hope you can stop by and link this up at my party that is open all weekend! There's still time to get in on the fun ... oh, and if you blog about your participation, give me the link in my comments thread and I'll blog about you next weekend! great job! love your style! This is my first post!! 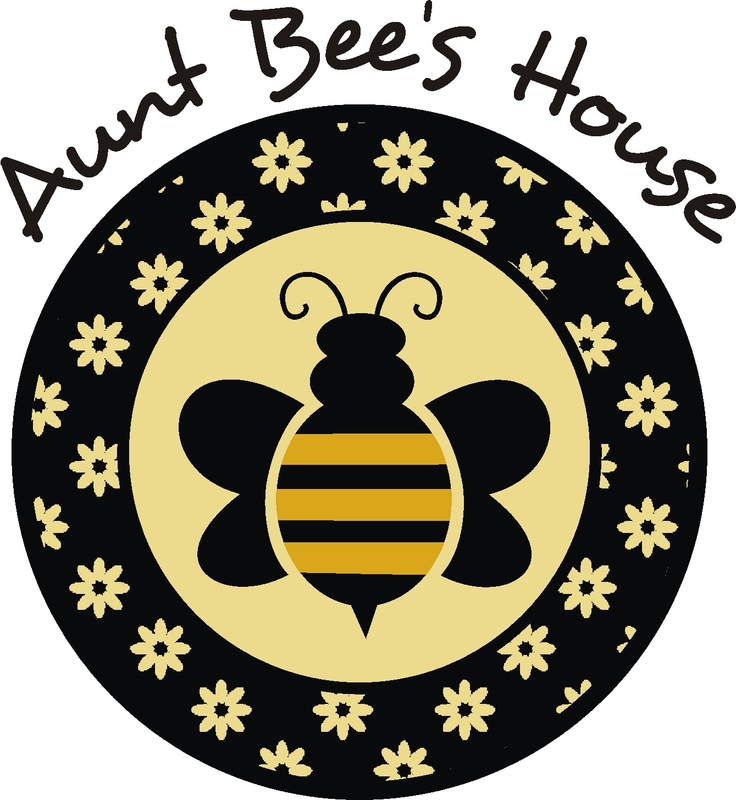 I am full of ideas to renew furniture and save a penny here and there. Currently I have two blue reclining chairs from LaZY boy I would like to reupholster to match my living room. I do not know where to start and feel a little intimidated...HELP!! It looks simple...pull a little here, staple here but how do you get it to look so neat in the end. Any advice would be appreciated. I have seen tons of beautiful stuff here and in other sites..I just get inspired, truly talented people!! Cute chair!! You are brave! You did a great job! Thank you for sharing this wonderful post at Potpourri Friday! Simply beautiful! 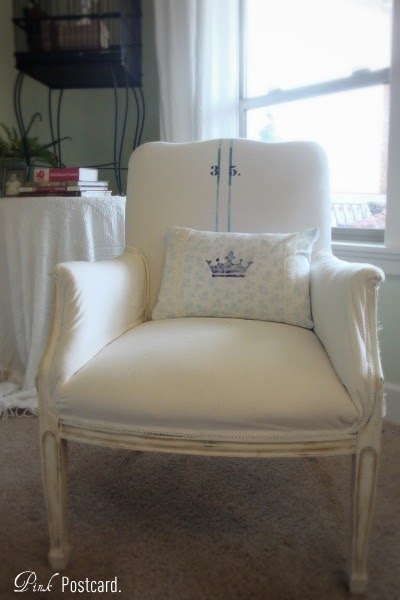 I can't believe this was your first time to upholster a chair! You did a fantastic job. This chair is stunning! You certainly are a good right out of the gate. I love the lightness of it and having that number with significance...that just makes it perfect. Your chair looks great. I like the trim also.....I am a new follower, feel free to stop by my blog. Great job, Denise! I haven't tackled one yet, so I'm applauding you!! I'll be featuring this post on VIF tomorrow! It's really fun to re-create a piece as you've shown! Wow! 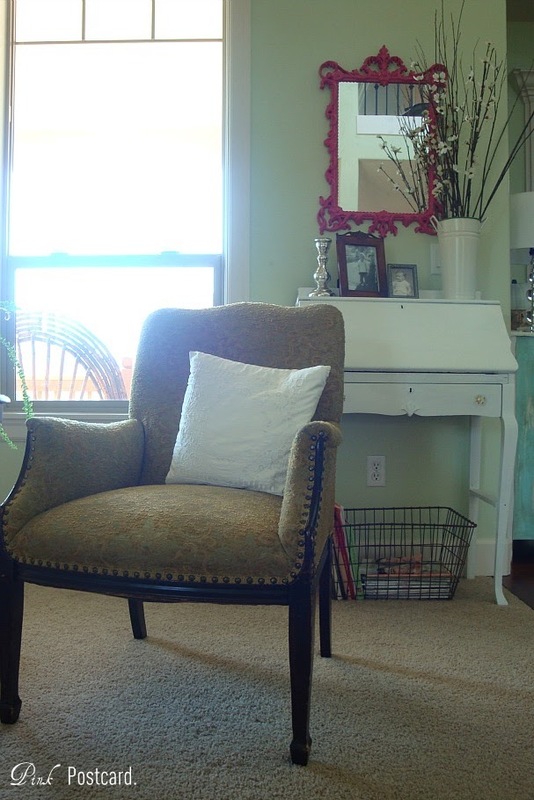 from drab to high-chic -- way to go! Thank you for linking up, I am featuring tomorrow. Wow, this chair is popular! Absolutely Beautiful! What a bargain. Beautiful job on that chair! I love the detailing on the back! Thanks for the inspiration. Beautiful chair! I hope I can find a chair like that soon so I can do the same thing! That chair is awesome! I haven't attempted upholstery yet. I'm your newest follower...found you at Town and Country Living. I hope you'll stop by sometime.